This is the first time in my career that I am working completely from home without having to go into an office each day. I was ecstatic about the opportunity and the flexibility I was being given, but I didn’t realize how difficult it would actually be. 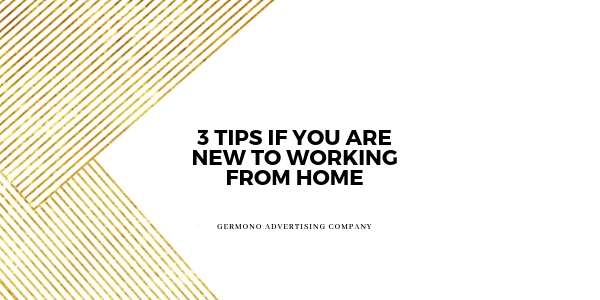 Here are three simple tips from me to you… my personal experience in successfully working from home! This might seem obvious, but I can guarantee most people who are new to working from home do not have a space dedicated for doing actual work. It is important to have a place to go to that will make you happy and inspired to tackle each day. If space is limited, be sure to have a desk set up somewhere in your home that will allow you to be productive. A place with great lighting and all the tools you will need to succeed. Having a printer, plenty of pens, notebooks, folders, a stapler, flash drive and comfortable desk chair are just a few of the things you will want when first getting started. Every Friday, make your to-do list for the following week. Each day should have specific tasks that need to get done and be sure to include times that you will be doing them. Accountability is the hardest part of learning to work from home, so it is important to be as organized as possible. Start with any meetings you have for the week and plan everything else around that. I am the biggest culprit of procrastination, my boss calls this “pulling a Rachael,” but seeing my tasks each day and being able to check them off once they are complete helps me to stay focused. Working from home means you have to start treating each day like you are going “into the office.” The biggest mistake most first timers make is thinking they can still have kids at home, TV’s on in the background, and all the other distractions that come with home life. I understand that every situation is different and that you might not be able to afford childcare everyday, but it is important to try and get as much alone time at home while working as possible. Also, try to refrain from engaging in any other activities that might derail your productivity. I try to keep my cell phone off my desk when working and limit the TV being on (even if it is great background noise).